An ideal high volume set-up, built to last for years and years with the poly-chain drive. 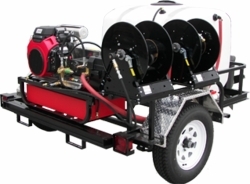 For a limited time, we will ship any Pressure Pro power wash trailer to you for FREE! You will also receive a certificate worth $400 towards an upcoming Contractors Foundation business weekend workshop. Here's your opportunity to save hundreds over our everyday discount prices when you order your new pressure washer from Sun Brite Supply of Maryland. These beautiful work horse trailers ship to you direct from the factory, fully run-tested and ready to perform your next cleaning job.